‘It has merely been a talk shop with resolutions and statements. Its notorious genocide resolution a month after regime change in Colombo last year, apparently passed to mobilize international actors, in effect polarized the country and undermined the new political space for reconciliation. The sad reality is that the NPC has lost its credibility with the local population’. So writes Ahilan Kadirgamar, a writer of no mean credentials and reputation. It’s time the Northern Provincial Council, its leaders and the Central Government in Sri Lanka took notice of what actually is taking shape in the Northern part of the land. Retired Supreme Court Justice seems to have missed his original brief and instead making instantaneous notes and the jury is waiting to hear the summation. The Central Government, on the hand seems to be oblivious of the embers that are burning under the red soil of the North, waiting for rare rains in as summer of an unpredictable landscape. Time is a cruel customer. It will wait for no one. In a fast-paced society in which the changes that are occurring far outmatch those who pretend that they could control and master the events to come. Politicians, officials, henchmen and would-be jockeys on both sides of the ethnic spectrum are playing a dangerous game- a game that would end with no winners but only losers. The tremendous socio-political neutrality that the cessation of the thirty-year war between the Liberation Tigers of Tamil Elam (LTTE) and Sri Lankan security forces entailed is diminishing. The international players in this game, the Tamil Diaspora, are entangled in what might be just outside their realm of competence. Geopolitical socio-political strategies are subjects of crafty diplomats and clever politicians. Years-long experience, scholarly backgrounds, disciplined preparation and crystal-clear objectives are a reflection of a professional proficiency. Mere loyalty to a cause backed by money, reputation, power and unrelated credentials would not hold one in good stead in the sheltered alleys of international negotiations. While not disregarding his extraordinary commitment to the cause of his Tamil brethren and unmatched credentials to be elected as Chief Minister of a troubled and traumatized province, the Chief Minister of the Northern Province and his cohorts, if there are any, must buckle down and start delivering goods instead of long ‘judgments’ as he was used to delivering from the Bench. The Supreme Court Justice Wigneswaranmust give way to the politician Wigneswaran and for that matter a rare variety of such creatures. The Tamils set an example in selecting their nominees and electing those nominees to office. Wigneswaran belong s to such select few, reminding one of those State Council and parliamentary days of a bygone era. But the current needs have changed. The guns have fallen silent; the terrain is devoid of landmines and the anguish of parents are receding to a faint but yet lingering memory. These objective conditions have changed; physical realities have altered the usual cycle of life in the North; the people’s lives have new demands and the cry for a better tomorrow has gained momentum but unlike in the South of the country, that cry is more mute in sound and profound in substance. A people who have seen the dark side of ethnic diversity; a people whose lives were altered irrevocably by the depressing sounds of guns and landmines, a people whose children’s education was sacrificed at the altar of illusion of Elam, a people who once gave birth to the Ponnambalam brothers and eminent scholars of the caliber of Ananda Coomaraswamy, who nurtured and nursed secondary schools such as Vembadi Girls High School and Jaffna Central, farming was their livelihoods and education and scholarship their contribution to the national treasure. Yet again, they also produced murderous terrorists like Prabhakaran, Mahattaya and Pottu Amman. Whatever people in the South of Sri Lanka talk about, however they try to portray their immediate past, Tamils would not like to be remembered as those who cowed down to Prabhakaran and his killers. In the same strain, Sinhalese Buddhists would want to shed the Sinhalese past which produced killers of the nature of Rohana Wijeweera, Gamanayake and Saman Piyasiri Fernando of the Janatha Vimukthi Peramuna. The remaining leadership of both sides now have ostensibly discarded the violent veneer of their past. In the ultimate analysis, the legacy of both Tamil Militant Wing and Janatha Vimukthi Peramuna would be ashamed to leave behind a legacy of wonton killings, ethnic cleansing and macabre dispensation of ‘justice’. Kadirgamar’s article sheds light on the immediate needs and promises broken and forgotten by those who pledged them. A broken palmyrah is being replaced- although nothing can replace a one that is broken by another broken entity- a vacuum of promises and dreams and aspirations. In such a terrible background what can the Northern Provincial Council do? What can the Central Government do? At the helm of the North and the Center are two enlightened gentlemen. 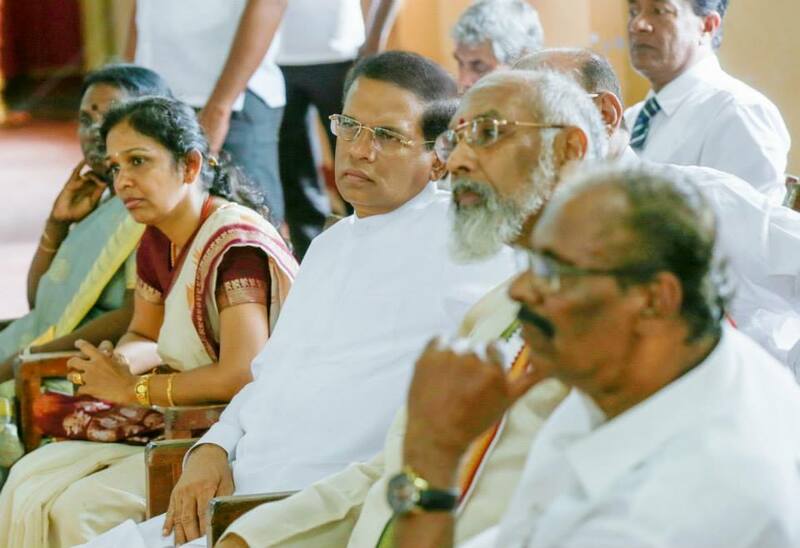 Two serious politicians, one, Chief Minister Wigneswaran, who sees everything in relation to his defeated people, their crushed dreams and ruined aspirations and hopes, and the other, President Sirisena, whose leg is being pulled by the fringes of the Sinhalese community bent on never conceding what is rightfully due to the Tamils of the land. What policies and programs could be implemented to uplift the lives of the Tamil generation that are still living in the North and the East? The answer lies not in nuanced strategies and sugar-coated packages. An accelerated program of development, in the likes of the massive Accelerated Mahaweli Program in the ‘70s and ‘80s need to be launched in the North. Not necessarily around agriculture exclusively, but a well architectured portfolio of development, covering agriculture, fisheries, tourism and industries. If the Central Government could launch a Megapolis embracing the Western Province, why it cannot unveil a similar government-assisted but self-funded mega development program in the North and the East. The majority Sinhalese must refuse to live with a monitory’s mindset. Fear of being invaded by the Indians and particularly Tamilnadu is nothing but just plain fear. Such a mindset cannot embrace modern concepts of integration and assimilation. So it is true in the context of the Tamils in Sri Lanka too. Generations-long memories of subjugation and fabricated accusations of ethnic cleansing by the majority are a great hindrance to an open-minded approach. Such imprudent pronunciations and one-sided commentaries will invariably find ready listeners and readers whose objectives are questionable and suspicious. Ignazio Silone, the great Italian writer and thinker described himself as thus: I’m a Christian without a church, socialist without a party and a citizen without a country. Such sublime words may not suit any of our leaders today, but the latent truth that lies behind the quote is universal and all-encompassing. The rich and salubrious red soil that the Jaffna farmer tills day in day out without care for the brutal punishment the scorching and exacting sun assaults on the his bare back has wonders to tell generations of farmers and peasants. Graduating from the classrooms of dignity and pride he must not be allowed to be outcaste as a second-class citizen in his own land. I have said this before and do not have any hesitation to repeat it: no majority is worthy of its numbers if it does not grant equality to their minorities. That in itself is betrayal of the core of human values; it is the abandonment of fundamental principles that hold a community together as a cohesive entity. Forget about the Prabhakarans and Pottu Ammans and Mahattayas; forget about the Ponnambalams, Coomaraswamys and Doraisamys; think about the ordinary folks who make up the bulk of the Tamil population in the North and East. They deserve our attention; they demand our unequalled sense of equality. Demagogues of the Bodu Bala Sena and Ravana Balakaye tinge cannot be silenced; but they can be outnumbered and outwitted. Some sense must prevail, if not, the signals are clear and unfiltered. A second, third, fourth or even a fifth uprising in the North of Sri Lanka is not only inevitable it would seem logical. Just because it may arise after our time is no excuse for procrastination of finding a cooling sensation to this burning ethnic embers in Sri Lanka. Those who occupy seats of power in the North as well as the Center would be well advised not to disregard the relative calm in the desert lands of Jaffna and Kilinochchi and Vavuniya. Beneath that inexplicable calm may well reside a yearning for betterment, equality, racial integrity and justice. Victory at war is no substitute for treatment as equals in the huge human family.